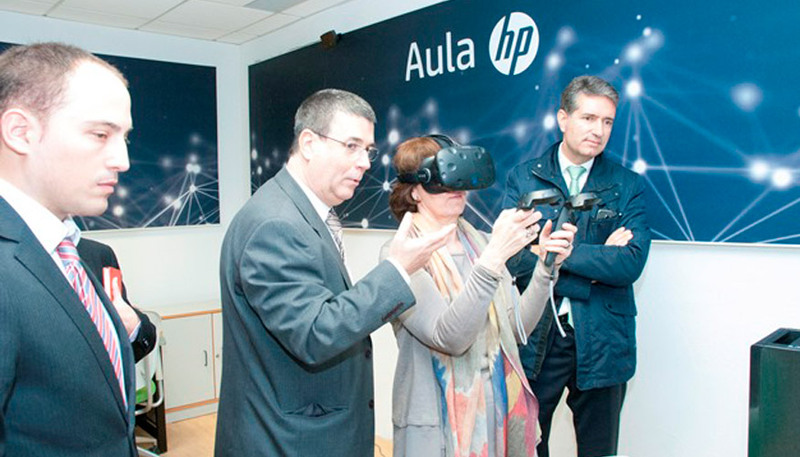 The Rey Juan Carlos University and the company HP in collaboration with SPika Tech have signed an agreement for the creation of an HP virtual real classroom where future professionals specialized in virtual reality and augmented reality will be formed in the campus of Móstoles (Madrid) . This initiative will make it possible to complete the practical training of the students of the URJC, in particular those who study in the field of engineering, experimental sciences, computer science and communication technologies.. This new classroom of the URJC has an initial endowment composed of last generation virtual reality equipment, such as those that allow the visualization of highly complex models based on the Z840 workstation or Z640 Workstation, as well as those used in the field of medicine Based on the Z640 workstation with the ZVR virtual reality monitor. The classroom will also have equipment such as augmented reality Sprout or the development system Z440 with DreamColor monitors, technology developed by HP that guarantees high fidelity in the display of colors.